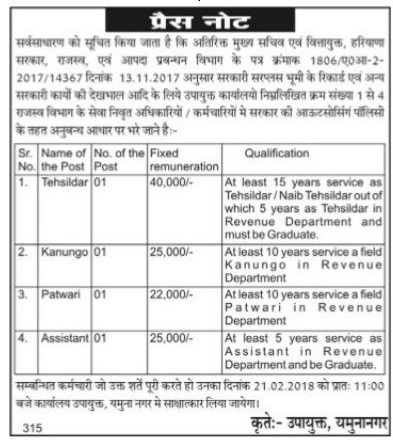 DC Office, Yamunanagar invites candidates for walk-in Interview to recruit staff for अतिरिक्त मुख्य सचिव and Disaster Management System, Haryana for various posts Tehsildar, Kanungo, Patwari, Assistant posts. Eligible candidates will appear for Walk-in Interview on 21.02.2018 at 11:00 am. Check the eligibility criteria, Selection procedure & other details given below. Eligible and interested candidates may appear for walk-in Interview DC Office, Yamunanagar on 21.02.2018 at 11:00 am. Ensure your eligibility from official website before apply.